Sublime and earthly – Lubov Bielykh belongs to generation of the artists whose creative carreers began in the 1980’s. For Russia, it was a period of hope, aspiration for freedom, and willingness to reorganize all the aspects of life. Most young people turned to new tendencies in art, hastily owerthrowing the academic canons. However, such a rebellious spirit is alien to Lubov Bielykh. An integral and consistent person, she has a delicate and deep perception of the world around her, and in her creative search, she is guided by classical art traditions, developing and strenghthening them in today’s reality. Lubov Bielykh was born in 1961 in the family of two well-known painters – Aleksey and Nadezhda Bielykh. Since her early years, she has demonstrated an outstanding talent for art. Lubov completed Moscow Secondary School for gifted children attached to V. I. Surikov Institute. Then, from 1980 to 1986, she was attending I. E. Repin Institute of Painting, Sculpture and Architecture in former Leningrad (now St. Peterburg) as a student of People’s Artist of the USSR A. A. Mylnikov, one of the strictest and most exigent professors. After graduating from the Institute, Lubov Bielykh continued to perfect her mastery at creative workshops of painting attached to the Academy of Arts of the USSR, where she worked under the guidance of People’s Artists of the USSR Tkachiov Brothers. She was also working at the Academic Country-Cottage of Artist’s Union among the leading Russian painters. She was a gifted woman since birth, but it took her a lot of hard work and persistence to achieve success in art. Since her childhood, she was brought up in an atmosphere of devotion to exalted art, but the influence of her parents was delicate and wise. Although her father, People’s Artist of the USSR Aleksey Bielykh, was an exigent teacher, he never forced his opinions on his daughter, but only guided her development. Lubov’s mother, Nadezhda Bielykh, managed to create family relations based on love, understanding and mutual support. All this remained in the soul of Lubov Bielykh and seems to be the reason why she very often portrays her family and relatives in her paintings. In Lubov Bielykh’s arts one can see everything she appreciates in life. She really enjoys the surrounding nature depicting its beauty. A man in her paintings is always an integral part of this world of nature and landscapes very often serve as the backgrounds for her portraits, esecially in the earlier period of her work. Her pictures-portraits “Morning”, “Young Mother”, “Evening near the Volga” and some others appeared at important exhibitions in the 1980’s where they provoked a strong interest of art critics. They noted “a suprising subtileness, purity and delicacy of her paintings, completely free from sickly sugariness and emptiness”.All this is also innate to later periods of Lubov’s work. Goal-oriented and hard working, Lubov was seeking her individual style of painting, her topics and her characters. Very often the artist painted her sister Vera and her nephews. The children’s portraits look so natural and charming that poetics of a cosy home emanates from them. We can see these children again in the paintings “Brothers”, “Painter at work”, “Childhood on a riverbank” displaying an innocent and happy childish world in a subtle and sincere manner. Thus, the artist emphasizes the significance of cordial and heartfelt relations in a family for all mankind. Using new painting techniques, she continues creating portraits of children, deeply penetrating in their inner universe. She skillfully paints a naughty cheerful boy – Kiril Kolupaev, as well as serious and dignified Catarina von Arnim. Another important topic of Lubov’s paintings is motherhood. She created a whole series of arts representing a woman with a baby in her arms, all of them full of purity and affection. Here, Lubov Bielykh sublimates a usual every day episode in the same way as Renaissance artists used to do. The artist’s real success is one of her latest paintings – “Mother and Baby”, whose pictorial structure combines Impressionist perception of an instant and Renaissance assertion of sacred maternal love. Since 1996, Lubov Bielykh and her husband have been living in Munich in Federal Republic of Germany. Lubov’s latest paintings have been inspired by her closer understanding of the world’s masterpieces, first of all, by the works of 15-16th century Italian artists, that have been stirring her since her youth. Diptych “Annunciation” can be considered as one of the culmination points in the artist’s creative search. Lubov managed to express the emotional state of young Maria in a touching and heartfelt manner. We can feel a significant influence of early Renaissance artists in this work. Lubov Bielykh continues to follow the traditions of Russian realistic painting, remaining true to her convictions. However, West European trend can be clearly seen in her paintings. The triptych united under the title of “Crucifiction” enables us to understand that Lubov Bielykh’s arts belong not only to Russian culture, but as well to European culture. Landscape ranks high in her work. The ability to perceive the beauty of her native scenery near the Volga, depicted in her numerous sketches and paintings, helped her to comprehend and sense the charm of nature in many European countries. 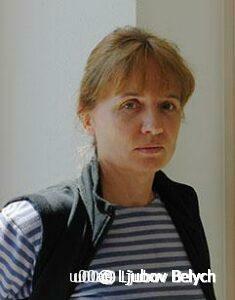 Lubov Bielykh’s artistic success is widely recognized in Russia. In 1988, she became a member of the Artist’s Union of the USSR; in 1996, she was awarded the Diploma of Russian Academy of Arts. In 2002 an exhibition of her works was presented in her native land. Some of her paintings belong to musea and private collections. Whatever she paints – complicated thematic pictures, landsapes or still life – all her works expose purity and sublimity of the Russian heart.